The debate: Plastic: the greatest technological advancement of the 20th century or an ecological scourge? Plastics, or polymers, are so pervasive in our everyday lives that their use and disposal often are taken for granted. As a result, their effect on the environment is under increasing scrutiny. The course also covers the history of plastic and why we’re burdened with incalculable amounts of waste and struggling to find answers to pollution and sustainability. 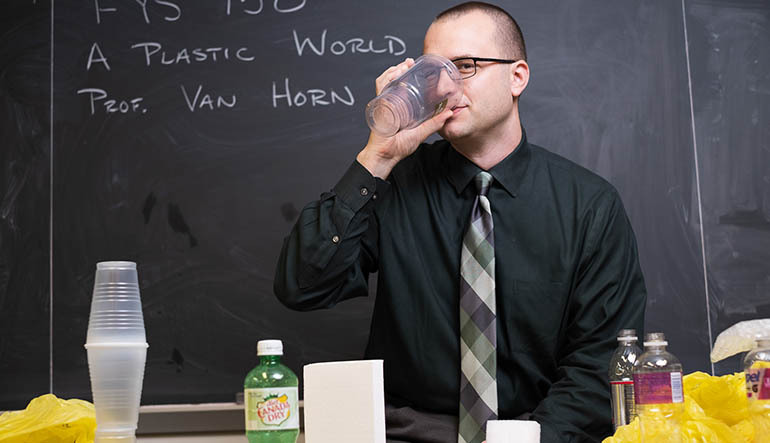 The prof: Ryan Van Horn ’04, associate professor of chemical and biomolecular engineering, who’s researching the structure of plastics and how that structure influences how plastic is used in certain products and its degradation over time. His students are looking at plastic with fresh eyes, starting with plastic pollution and discussing in broader detail what plastics and polymers do for us and to us. Ryan Van Horn’s research is in phase behavior and structure-property relationships of polymers. “That’s a fancy way of saying that we look at the structure of plastics and how that structure influences, say degradation, over time,” he says. What’s on the agenda? Lots of conversation starters, to be sure, including the classic scene from The Graduate, where Benjamin Braddock, fresh out of college and eager to succeed in upper-middle class society, receives some valuable career advice from a neighbor. “One word: plastics.” Like plastic itself, the 50-year-old cinematic line has held up over time, inspiring laughs from Van Horn’s students. Our longtime companion: We may think of plastic as a synthetic incarnation of the modern age, but human civilization has used natural polymers, such as rubber, for thousands of years. Polymer and plastic: what’s the difference? “Polymers are the molecules that make up plastic; plastic is the product that you use every day that’s made up of those polymers,” Van Horn says. Synthetic polymers, the oops invention: In 1839, Charles Goodyear made a technological leap when he accidentally spilled raw latex with sulfur onto a hot stove, creating a charred substance that didn’t melt in extreme heat. Plastic as we know it: Combining formaldehyde and phenol, Leo Baekeland in 1907 created a completely synthetic polymer and branded it Bakelite. It marked the start of what we think of as plastics. Cheap and moldable, Bakelite replaced expensive materials, like porcelain and ivory, flooding the marketplace with inexpensive knickknacks and jewelry. Plastic in pop culture: From Andy Warhol’s Silver Clouds, which used helium-filled, pillow-like forms made from metalized plastic film, to Nathan Sawaya’s Heartfelt sculpture made from LEGO bricks, plastic continues to permeate art galleries. Convenient and toxic: Van Horn leads probing discussions about how we take plastic for granted—from toothbrushes to pacemakers—yet with its omnipresent durability comes the dilemma of how to dispose of and recycle it and curb widespread pollution. The International Energy Agency released a report on Oct. 5 predicting that oceanic plastic waste is likely to more than double by 2030 from the 100 million metric tons that have already leaked into the seas, choking aquatic life and polluting beaches. Sea change for plastic? Van Horn is hopeful research will one day reveal a polymer that will allow plastic to degrade and break down, like an organic substance. Until then, discussions will continue to center on how society can reduce the amount of plastic it consumes and encourage policies to recycle plastics more aggressively. “It’s a complicated thing, and it’s something that the students are starting to understand,” he says.